It was fifty years ago today, on February 1st, 1960, that four freshmen students from North Carolina A&T strolled in to the Woolworth's on North Elm Street in Greensboro, North Carolina for a bite to eat. 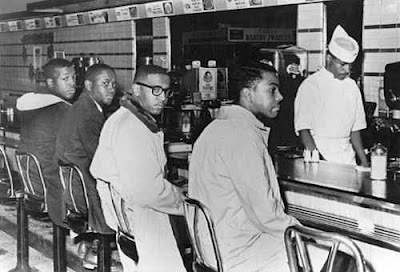 The lunch counter was segregated, as were many places throughout the country at the time. Only white people were served at it. Ezell A. Blair Jr., David Leinhail Richmond, Joseph Alfred McNeil, and Franklin Eugene McCain were black. They could order food at the Woolworth's and eat it there, but they were expected to stand and not use the stools and chairs reserved for white people. The four young men weren't served their lunch, and eventually left. The next day they came back and 27 friends joined them. The next day, even more people arrived. And very soon the sit-in movement spread like wildfire throughout other cities across the country. A few months later, segregation was finished. The Woolworth's began serving everyone at the lunch counter. On this fiftieth anniversary, The Knight Shift and its proprietor gladly tips its hat to Ezell Blair Jr., David Richmond, Joseph McNeil, and Franklin McCain. If more people had the simple gumption that these four demonstrated a half-century ago, this would no doubt be a far better world.